Is Solitary Confinement A Form Of Torture For Army's Alleged WikiLeaks' Source? : The Two-Way The furor surrounding WikiLeaks' release of confidential United States government documents has focused reams of attention on transparency advocate Julian Assange. Largely lost amid all of the hubbub has been Bradley Manning. The furor surrounding WikiLeaks' release of confidential United States government documents has focused reams of attention on transparency advocate Julian Assange. 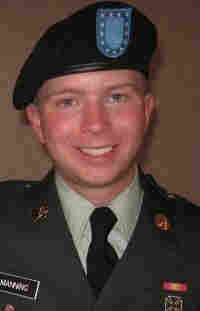 Largely lost amid all of the hubbub has been Bradley Manning, the Army private who allegedly provided the documents to WikiLeaks. Glenn Greenwald has a provocative piece on Salon that argues Manning is being severely mistreated through a system of solitary confinement that could lead to permanent psychological damage. Manning has been in military detention for seven months, first in Kuwait and now at Quantico in Virginia. "Just by itself, the type of prolonged solitary confinement to which Manning has been subjected for many months is widely viewed around the world as highly injurious, inhumane, punitive, and arguably even a form of torture. In his widely praised March, 2009 New Yorker article -- entitled 'Is Long-Term Solitary Confinement Torture?' -- the surgeon and journalist Atul Gawande assembled expert opinion and personal anecdotes to demonstrate that, as he put it, 'all human beings experience isolation as torture.' By itself, prolonged solitary confinement routinely destroys a person’s mind and drives them into insanity. A March, 2010 article in The Journal of the American Academy of Psychiatry and the Law explains that 'solitary confinement is recognized as difficult to withstand; indeed, psychological stressors such as isolation can be as clinically distressing as physical torture.'" Greenwald's critical analysis of Manning's treatment, of course, stands in stark contrast to the point of view voiced by popular commentator Bill O'Reilly and by Rep. Mike Rogers (R-MI) that providing the documents to WikiLeaks was a traitorous act that should be punished by execution.